Social media has undoubtedly become an integral part of our daily lives, as a means of communication and information as well as platforms for distribution of news and thus a central arena for the public debate. In line with this development, the ‘tone’ used in social media has attracted much attention. On the one hand, social media has made it easier for many to use their freedom of expression and to participate in the public debate. On the other hand, we are beginning to see the down side to it, namely online hate and harassment that affects the civil engagement in the debate – also known as the chilling effect. In a recent survey that is nationally representative, half of the respondents said that the tone on social media debates keeps them from expressing their opinion and from participating in the debate. This is the case for 43 % of the men and for 58 % of the women. The fact that a harsh tone scares people off, points to a democratic problem with consequences for the public debate. Up until recently, there has been no figures on the extent and character of hate speech on social media in Denmark, and for this reason, the Danish Institute for Human Rights conducted a study on hate speech in the Danish public debate online in 2016. The study is based on two methodological approaches: a quantitative content analysis on Facebook, and a questionnaire survey carried out among Facebook users. The main results are presented below. The eight grounds that we focus on here are all protected under human rights law. News media outlets have historically always played a key role as facilitators and moderators of public debate via the editing of news articles and topics for discussion. The growing use of social media means that they have now also become the hosts of some of the Danish Facebook pages that have the largest number of users. It was therefore natural for us to study this part of the public debate online. The content analysis consists of 2,996 comments taken from the Facebook pages of the two largest news outlets in Denmark – DR Nyheder and TV 2 Nyhederne. The comments collected have been online for a minimum of 12 hours. This was done to allow the two news outlets and Facebook reasonable time to edit and possibly delete comments conflicting with their guidelines. The analysis shows that one in seven of the comments that remain after editing are hateful (see below). This means that by far the majority of the comments (85%) were not hate speech. However, 15 % of the online public debate related to the news articles on the two Facebook pages consisted of hateful comments aimed at individuals or groups. 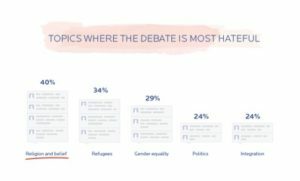 Hate speech most often appears in connection with news posts about religion, refugees, gender equality, politics and integration. Who is targeted in hate speech? In most instances, hate speech is targeted at politicians or people’s political beliefs. In addition, people’s ethnicity and religious beliefs are areas that often draw hateful comments. From the hateful comments directed at religion, 86 % of the comments are directed at Muslims. Hate speech directed at gender is more often directed at women (58 %) than men (39 %). 76 % of the hateful comments are written by men, which is a clearly overrepresentation seen in the light of the gender balance among Danish Facebook-users as well as men’s share of comments in the analysis. 1) stigmatising, 2) derogatory, 3) offensive, 4) harassing, and 5) threatening. This indicates that the news media have succeeded in weeding out comments that can be perceived as actual threats. However, the fact that one in seven comments is hateful indicates that the news media still do not quite know how to deal with hate speech that is not an actual threat. The survey among Facebook users in Denmark shows that 48 % of the users refrain from participating in a debate if the tone is harsh. 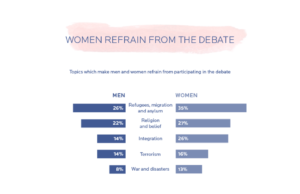 The users especially refrain from debates concerning refugees, migration, asylum, religion and integration, and more women than men avoid participating in debates on these topics. Because of the harsh tone, many users surrender their freedom of expression and refrain from participating in the debate. At a time where much of the public debate takes place online, it is important to discuss the news media’s responsibility with regard to combating hate speech. In a Danish context, the media’s legal responsibility when hosting online debates on social media platforms remains unclear. As such, there is a need to clarify what responsibility news media outlets have with regard to debates on the social media platforms that they facilitate. When asking Facebook-users, a large majority (77 %) believe that the media has a responsibility to remove offensive and derogatory comments. This indicates that users want the media to be more proactive in ensuring a civil tone in the online debate. The question is how the media should approach this task, without violating freedom of expression. However, the fact that one in two refrain from participating in the public online debate is an issue that we should all – but news media especially – take seriously. Article 19. ‘Hate Speech Explained. A Tool Kit. 2015 Edition. ECRI General Policy Recommendation no. 15 on Combating Hate Speech. Adopted on 8 December 2015. Article 21, section 1 of the EU Charter of Fundamental Rights. See also Article 19. ’Hate Speech’ Explained. A Toolkit. 2015 Edition.